U.S. diplomats said in cables that Brazil saw the war on terror as "overly aggressive"
(CNN) -- The Brazilian government "remains highly sensitive to public claims suggesting that terrorist or extremist organizations have a presence" or are active in the country, according to cables released by WikiLeaks. In a series of documents dated between 2005 and 2009, U.S. diplomats regularly reported on the South American heavyweight's effort to distance itself from what it sees as an "overly aggressive" American war on terror. Brazil also seemed to fear stigmatizing its large Muslim community and "prejudicing the area's image as a tourist destination," according to the leaked materials. A 2008 cable also stated that high-level Brazilian officials "will vigorously reject any statements implying" that terrorists have a presence in Brazil. The cable -- from U.S. Ambassador Clifford Sobel -- said one major issue was Brazil's refusal to "legally or even rhetorically label U.S.-designated terrorist groups such as Hamas, Hizballah or the FARC (the Revolutionary Armed Forces of Colombia) as terrorist groups -- the former two being considered by Brazil as legitimate political parties." Another issue was Brazil's sluggish ratification of anti-terrorism and anti-money laundering legislation that was prepared months earlier. 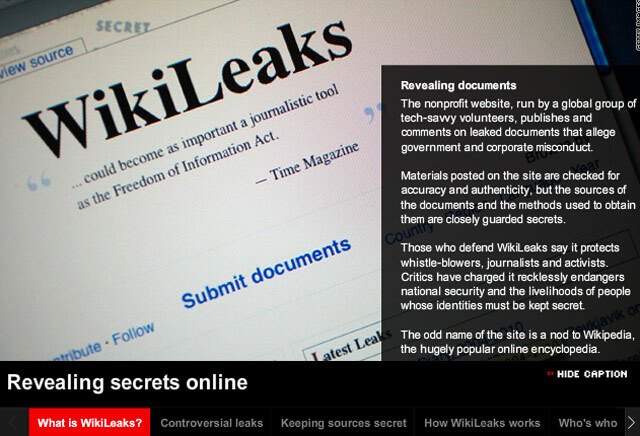 Should secret documents be made public? According to the same cable, Brazil was more concerned with the Tri-Border Area (TBA), where its borders meet Argentina and Paraguay. According to the cable, Brazil's focus was specifically drug and arms trafficking, money laundering and smuggling counterfeit goods. The cable noted that "while there are some individuals suspected of having links to Hizballah and HAMAS, there is little evidence these groups have an operational terrorist presence in the [TBA] region." One of the leaked cables details Brazil's preferred method of dealing with terrorists: "The Federal Police will often arrest individuals with links to terrorism, but will charge them on a variety of non-terrorism related crimes to avoid calling attention of the media and the higher levels of the government." Various individuals that have been suspected of funding terrorism have instead been arrested on customs and narcotics charges, according to the cables. Brazil's counter-terrorism policy seemed to shift in 2009. A cable titled "Country report on Terrorism" from that year detailed the government's strategy to deter terrorists from "using Brazilian territory to facilitate attacks or raise funds." One of the deterrence methods included clamping down on illegal documents, which included "one of the largest visa fraud cases of its type in U.S. law enforcement history." Authorities also started keeping a close eye on Arab residents who might be influenced by Arab extremists and/or terrorist groups." The same cable also mentions Brazil possibly using unmanned aerial vehicles to monitor border regions. In October 2009 the Brazilian government admitted for the first time that "terrorists could become interested in Brazil because of the award of the 2016 Olympics to Rio de Janeiro." This prompted a reform of the Brazilian Intelligence Agency which seems to have satisfied the U.S. mission there. A month later, the U.S. sent Special Representative to Muslim Communities (SRMC) Farah Pandith to Brazil to "engage" the majority Sunni Muslim population in Sao Paulo. A cable about her visit said she was received "enthusiastically."